Our opera fans Elizabeth Frayer and Shawn E. Milnes are getting out and about again. Elizabeth: It was like Disney vomited on stage. Bright green and purple outfitted chorus members crowded around Violetta and Alfredo as the walls of the static stage were lit green and the floor purple. Diana Damrau as Violetta was totally in control of her voice and was beautiful as usual. Juan Diego Florez as Alfredo also sang beautifully though it was hard to hear him at times. Not only did the orchestra drown him out at times but even when the orchestra was not overpowering him it was difficult to hear him. It even seemed at times that Damrau was holding back so as to allow Florez to be heard…. Entering the Met Thursday night, I made my way through the inexcusably hectic and tightly packed crowd through the narrow hallway the Met calls a lobby. This is a serious problem the Met must remedy. It’s a miracle no one has been injured or violence hasn’t erupted yet in the mad crunch in front of the ticket takers. I know there’s been discussion of extending the lobby out to under the over hang of the exterior grand tier balcony so let’s get to that. There must be some billionaire who would love to have the Met lobby named after them. But I digress. Upon entering the house proper I immediately saw a bearded young man with a beautiful bomb sniffing golden retriever. That was new. Bomb sniffing dogs no matter how beautiful are new to me at the Metropolitan Opera. I asked the young man the dog’s name and he told me “Brava”. 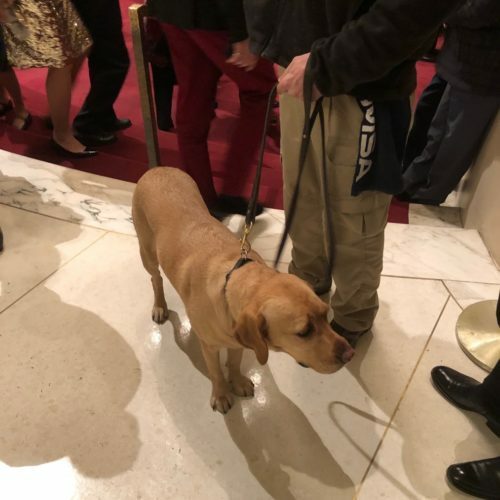 Brava the Opera House Bomb Sniffing Dog seemed almost too perfect. I actually did feel a bit safer with Brava there and she was perfectly at ease so I figured I should be too…. Read their full review of Yannick’s opener here. After Bataclan the gendarmes outside the Limoges opera wouldn’t allow water bottles in, just like the airport checks. Looks more like a yellow Labrador Retriever to me. Goldens have longer coats. It might also be of interest that “bomb sniffing dogs” look very similar to “drug sniffing dogs”. I think you’re right. He or she was there on opening night too. Very gentle-looking dog. Shawn is right about the lobby. Way too packed and unpleasant with rude people bumping into you and long lines for the bathrooms. I like the Met Opera House in general but that’s a shortcoming that hopefully the south entrance renovation will alleviate. If this is all true how frightening must have been the evening.No wonder the form is dying if not already dead. Obviously, the more relevant quotes that you could have selected are the ones about the new music director. But being relevant isn’t your priority, which I understand. The new Music Director, Yannick Nézet-Séguin, is terrific, eliciting beautiful light touches out of the orchestra, while later party scenes played with unusual zest. The Met orchestra has always been terrific, but Tuesday night seemed like a new orchestra. But honestly anything negative in the production or evening was overshadowed by the excitement generated by Yannick Nézet-Séguin and the Met orchestra. The audience was genuinely excited. Not the respectful, though loud, cheers of support that Levine has gotten in the past few years but genuine excitement and buzz. Huh? Norman gave us the quotes that interested or amused him. Sounds like another production with superb music, best heard with eyes closed? Dante would probably allocate a special circle of hell to gimmicky opera directors. The ENO had a season full of them a few years ago and has never fully recovered. Actually, it was a mixed bag musically as well. Florez has no business singing this part. Damrau sang beautifully, but cautiously. The baritone (Kelsey), a singer I wasn’t familiar with, was indeed excellent (his voice reminded one of Leonard Warren). As for the Canadian Hotdog, his conducting was limp and ridiculously mannered. Apparently, he has two modes – breathlessly fast for childish “excitement” and languidly slow for saccharine “profundity”. Well, well, well…so Maestro Terrific and his merry band are drowning out the singers (as he has done many a time). No “cult of personality” here – only a thousand bottles of champagne post-opera with Maestro’s name on them. Gotcha. And the green and purple decor reminiscent of the aftermath of a seasick dog’s dinner? But taste is so passé, n’est’ce pas?